Not only is this a awesome cuffink for your shirt, it is a really interesting electronic gadget. 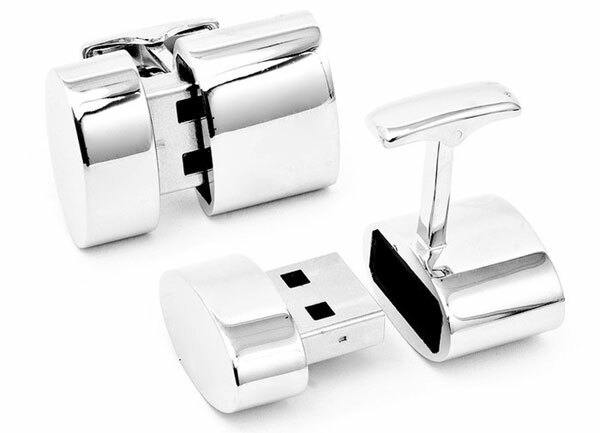 This is the Brookstone WiFi cufflinks. It is a cufflink. It acts as a 2GB USB drive, and also can function as a wireless network when plugged into a computer. That's all. While you will need software to use the WiFi hotspot feature on it, the USB portion of it will not require any software. The device can connect to smartphones, iPads, or any other wireless device according to them. The price is $250 with 2 year service plan for $39.99, and a 3 year service plan for $49.99. Sadly, there is not press release for this, or at least that is all that I know for now. I'll update the post with a press release if I can find one. Click here to see the page from Brookstone themselves.